See Carfree Times #37 for an update on fuel-cell efficiency. It's far lower than is usually claimed. This largely invalidates the proposal made here. Instead, some form of battery-powered tram with in-station recharging would be more sensible and probably much cheaper. The error regarding fuel-cell efficiency has been widely propagated, so beware. In fact, the Short-Wire Tram proposal now looks highly realistic due to the development of ultra-capacitors. This is a relatively inexpensive technology and saves most of the cost of installing overhead wires. It is, thus almost certainly a better choice than fuel cells. It is well known that high-capacity public transport systems are more energy efficient if they are based on rail rather than road solutions. The inherent efficiency of steel wheels running on steel rails is appreciably higher than that of pneumatic tires running on pavement. The difference becomes more pronounced as speed increases. In addition, the long, thin shape of a rail vehicle causes less aerodynamic drag than the short, blunt shape of a bus. For these reasons, rail solutions are to be preferred to road solutions as long as the demand is high enough to keep the vehicles reasonably full, as can be expected in most urban operations. It is for these reasons that in the era of horse-drawn transport, rail vehicles were much more economical to operate than omnibuses running through the streets on rubber tires. The removal of the vast trolley and inter-urban rail systems that once blanketed the USA stems, therefore, from another cause than efficiency. While this is a complex and even contentious subject, some facts are clear: at the present time, the USA has far less light-rail system mileage than it did 60 or 80 years ago. The desirability of rail systems has not escaped either the transit operators or the riding public, and light-rail (the new name for streetcars or trolleys) is now fast finding favor in both the USA and Europe. In the coming years, if the anticipated energy crunch materializes, cities around the world will be seeking a cheaper and more efficient way to move people by public transport, and to install the system comparatively rapidly. If some of the problems with light rail, principally the capital cost, could be solved, then this approach would routinely be selected in preference to a bus system. What can we do to assure that this occurs, especially given the large preference of the riding public for light rail over buses? Fuel cell engines, based on the Ballard fuel cell, will be comparable to conventional engines in size, weight, operating life, acceleration and speed, range, and refueling time. The bus is actually a more difficult application than a light-rail vehicle, since space is at even more of a premium in a bus, and because more power is required to operated a bus (per seat) than a light-rail vehicle. 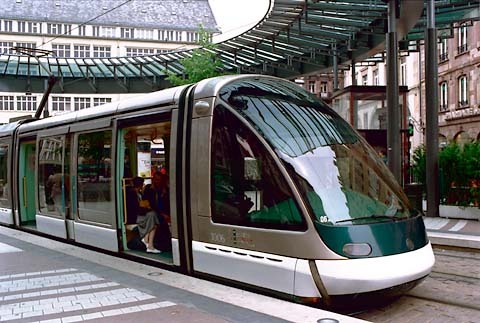 It is therefore proposed that a fuel-cell tram be developed as rapidly as circumstances permit. This is, however, only part of the required solution for cheap, effective, and rapid expansion of public transport capacity through the installation of new light-rail systems. Efficient street running requires the absence of competing traffic. Some years ago, Zurich, Switzerland, chose not to build a metro but to fix its tram system instead. Cars were removed from locations where they had formerly impeded the movement of trams, with a resultant improvement in schedule adherence. The results were little short of spectacular, and about 90% of commuters to downtown Zurich now use public transport. However, dedication of streets to public transport is not a popular notion in the USA and other auto-centric nations, although the change is essential to effective street running. One minor disadvantage of a fuel cell is that it cannot reabsorb energy generated by the motors when braking the train. It should be possible to use this energy to both heat and cool the tram, and while the efficiency of this conversion is probably considerably less than 100%, it is a improvement over simply dissipating the energy through roof-mounted resistance coils. One of the great advantages of the new EuroTram design is that it is 100% low-floor. There are no steps to climb, and low-level boarding platforms can assure rapid boarding of passengers, including those confined to a wheel chairs. For this reason, development of all new trams should be based on low-floor designs. There is a further economy of the light rail approach - while new buses have a life expectancy of no more than 20 years, new rail vehicles should enjoy a service life of 50 years, based on past experience. One of the bugaboos of US streetcar operations was the wide range of standards. As noted, the PCC streetcar was series-produced, although there was actually a considerable degree of variation, including a wide range of track gauges. Today, there is little reason to select any gauge other than standard gauge, 4 feet 8.5 inches (1435 mm). There are some advantages of meter-gauge in negotiating tight curves, but with modern vehicle design such as the EuroTram, this limitation is greatly reduced by the elimination of solid axles, which force both wheels to turn at the same speed, increasing resistance and causing the familiar irritating screech. One significant advantage of adopting standard gauge is that the vehicles can be delivered over conventional railroads. Recent experience with new light-rail systems in both the USA and Europe indicates a high level of passenger acceptance and nearly instantaneous popularity. In the face of fuel shortages, I think we can expect the public to readily support this approach, and if fuel-cell trams are developed, new systems can be laid very simply. We would then be in a position to install systems in less than a year, I think, and at much lower costs than we have come to expect. An added benefit is that the ugly overhead power supply can simply be omitted. If the need arises to rapidly expand public transport services with a minimum of expenditure, then the fuel-cell tram is an excellent candidate for the task. However, more is needed than just fuel-cell power. A return to street running can save huge amounts of money. The introduction of a standardized vehicle would yield a large economy in vehicle production costs, and the price of trams ought eventually to fall to that of buses, on a per-seat basis. It is now time for the government of the EU to sponsor the development of a fuel-cell tram based on a design similar to the EuroTram. There is another, odd alternative, in the event that an economical fuel cell cannot be developed, or that shortages of precious-metal catalysts prevent the widespread application of fuel cells in transport applications. Copyright © 2001 J. Crawford. This page may be freely reproduced provided that J.H. Crawford is acknowledged as the author, his copyright is maintained, and the full text is reproduced. By publication of this work, J. Crawford places in the public domain any original ideas contained in the work.